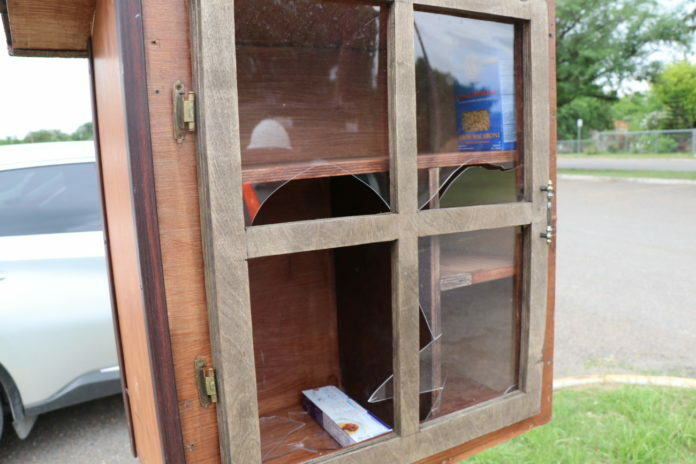 MISSION — Police here are asking for the public’s help finding the person, or persons, responsible for vandalizing the city’s blessing box on Mayberry Street, according to a news release. The city of Mission Food Pantry launched its blessing box program last year as a way of providing meals for those in need when the pantry is closed. Residents can access the boxes, which are stocked with dry and canned goods, any time of day. The blessing box in front of the food pantry at 115 S. Mayberry was vandalized Monday for the second time, according to the release. Anyone with information about the vandalism is asked to call Mission Crime Stoppers at (956) 581-8477, and callers may choose to remain anonymous. “Ever since word got out, we have had so many people inquiring how to help and donate even more,” she said. The Mayberry Street box is one of three blessing boxes in the city, with the others located at 905 N. Conway Avenue. Two more boxes will open this week, one at First Baptist Church at 1302 Doherty Ave. and the other at First Christian Church at 221 E. 12th St.